Find out why raising money for the American Cancer Society means so much to the employees at the invoice factoring company Bay View Funding. Glen Shu, President and CEO of Bay View Funding, strongly believes in a company work environment that encourages a feeling of community among his employees. A group of employees with no connection is less likely to pull together as a team to help make a difference. He was keen to find the right charitable cause that would also support his staff. Lynn Richard, AVP and Senior Account Executive, suggested the American Cancer Society because she has been involved in fundraising activities for cancer for several years. More importantly, Lynn is a cancer survivor herself. She was also aware of coworkers who had lost loved ones to cancer. Glen needed no convincing, and agreed that this should be a charity the company would support. The annual penny war is just a part of the story. For the past three years, Bay View Funding have also pulled together as a team for Relay for Life, a 24 hour event that involves walking laps to raise money for cancer. Lynn is the team Bay View Funding captain for the Mountain View Relay for Life event. She is proud of the many laps her team has completed over the years. They also sell lap beads, and sponsor T-shirts, as well as actually taking part in the relay. Lynn points out that dedication goes beyond just participation, “during last year’s Relay for Life we had 6 Bay View Funding team members sign up for CPS-3, a cancer study that will track these participants for the next 25 years to see if they can discover why some people get cancer and others do not. When they agreed to participate, they had to give a blood sample, a waist measurement and fill out a survey. We have some brave team members at Bay View Funding.” Not only that, but last year, because of Bay View’s level of involvement, one team member, Art Omega, was asked, and proudly accepted the honor of being sheriff of the relay! 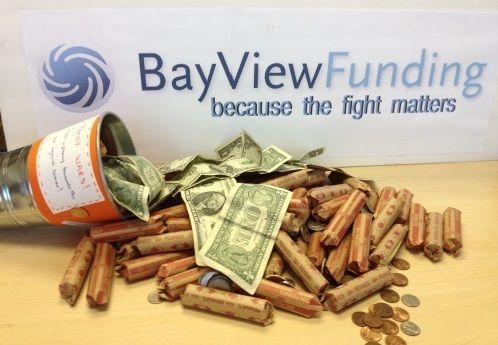 Bay View Funding will be involved again this year, and encourages all of you to show your company team strength and unity, and participate in some team philanthropic events. The Relay For Life of Mountain View will take place on Saturday, May 03, 2014 at Cuesta Park, 615 Cuesta Drive, Mountain View. The activities begin at 9.00 am. Click on Add to calendar to register.